The Eastfield Harvesters sit in a dark locker room with music blasting as they prepare to take the court for a game. It’s their pregame ritual: the calm before the storm. So far, it seems to be working.The Harvesters, who posted seven wins last season, are off to a 6-6 start with three consecutive wins. The Harvesters ended last year in the Region V semifinals, losing to Brookhaven and finishing 7-17, 5-6 in conference play. The team is starting fresh, with 10 new athletes who have joined the program and only two returners. Several players have had early success for the Harvesters. Three are ranked in the top 10 in the country in individual statistics, and the team is ranked fourth in the nation in digs per set. Captain Megan Murphy is ninth in the NJCAA Division III in kills per set while Grizelda Ortiz is ranked third in service aces. Freshman Captain McKayla Petters is ranked No. 1 in the nation in digs per set. “We have a great team this year. We bond great,” Petters said. 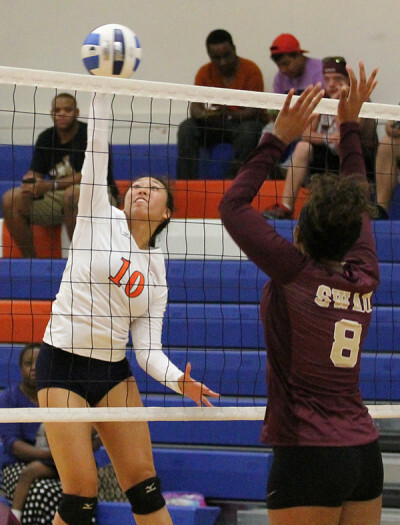 Eastfield still has some kinks to work out, being a young team. The Harvesters will continue to work on being more aggressive with their serves and becoming a more aggressive offensive team. The Harvesters started conference play at home against Brookhaven on Sept. 22. Brookhaven is ranked No. 1 in NJCAA Division III poll, and the conference is expected to be competitive. “We want to win conference, beat Brookhaven and go to nationals,” freshman setter Alyssa Jimenez said.